The first Leylands bought new (in 1952) by this Derbyshire operator were two Royal Tigers; SNU 234 had this C41C body whereas SNU 235 was B44F. Chassis numbers were 520911 and 520179 respectively. School journeys to Creswell swimming baths were often on this superb vehicle, arriving far too soon for me! About seven Leylands had gone before but all were second-hand, and all buses, so this one was special. The coach only stayed until 1963 and was later with McGregor, a contractor. I’m unsure whether or not it served any other operator in-between. SNU 235 lasted until around 1969 but I have been unable to find any photographs of this one. Nice!!! Thanks for posting. I wonder if Oxford Diecast can be persuaded to do a model of this one. I asked a while ago about the possibilities of having one of MTD235, but their reply didn’t leave me very hopeful. Still, the comments from Roger Cox when the Ribble version was issued – wrong shades used – might help them to get further issued right! 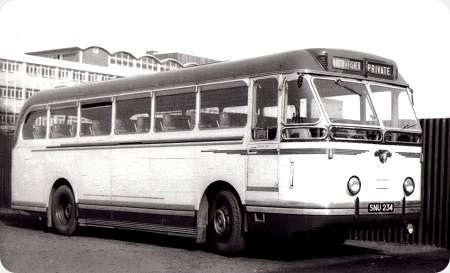 This design of Leyland coach body must have come as quite a shock after many years of coaches with curved waist rails. The later Ribble treatment of the lower front sill enhanced the appearance still further. Note the opening windows, they appear to be of the half(?) drop type and also the semaphore trafficator under the driver’s cab side window. The multi pane windscreen arrangement must have been a recipe for water ingress. Here is SNU 234 later in life with McGregor, contractor. Not a great shot but still worth seeing. I bought this five decades ago and photo is not back-stamped so I have no idea of copyright etc. I am pretty sure this coach was with Cherrys of Beverly. Yes Ian Wild you are right, the front faceted windows of the Royal Tiger coach do leak quite a bit and always did from new. I am currently restoring MTD 235 the Leyland demonstrator that was in Pennine’s fleet, it has wind-down windows and semaphore indicators below the cab – it is a very well built all-Leyland coach and a credit to the manufacturer. We have got the mechanics overhauled and am presently well on with refurbishing the interior – I hope the coach will be back on the road before too long. If anyone has any Pennine posters, notices, timetables, photographs and the like relevant to MTD 235 I would be pleased to see them to complete its history. Cherry of Beverley was the intermediate owner, SNU 234 was with them from 1963 until the sale to McGregor in 1966. Wonderful news, Phil. I hope to see MTD at the Tram Sunday event in the near future! Many thanks for your update re Pennine MTD 235, after the sad demise of Pennine Motors I and many others wondered what the fate of this special vehicle would be, after it being in store with Pennine for so long. I know it popped up for sale several times and then lost track of it, so well done for taking on the restoration and good luck with it!! Hope all goes well. I eagerly wait to see MTD 235 back on the road ,at the Pennine running day at some point maybe ? It is very gratifying to know that MTD 235 is undergoing restoration & it will make a fitting tribute to Pennine & Leyland Motors (indeed Pennine was a very loyal Leyland customer). 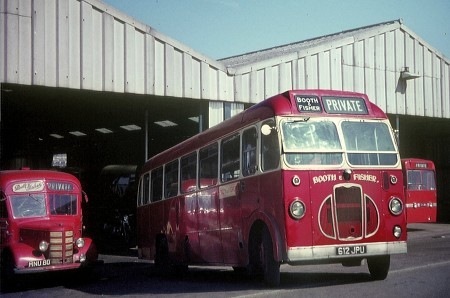 Does anybody know what has happened to the Plaxton Elite bodied Leopard which came to Pennine when still quite new when Ezra Laycock was taken over in 1972?. Pennine had put this on one side for possible preservation. Thanks for the memories regarding the run from Sheffield (Eyre Street stop) to Coal Aston. I used that bus when I was 9 until I was 11 (1959-1961) as I used to travel from my school to our home in Coal Aston on the, then, new Firthwood Estate. Boothies ran a wonderful eclectic collection of O type Bedfords built by a range of different firms. MNU 80 is an example of less common Allsop bodywork, and is seen, I think, outside Sheffield’s Midland Station. MNU is a Derbyshire registration from 1948. I suppose it would have been new to B&F. According to the Booth and Fisher fleet history on the Peter Gould site, this vehicle is described as C29F. The vehicle was new in 1948 and withdrawn in 1968. The location is Sheffield Midland Station and the vehicle would probably be operating on hire to British Railways to ferry train crew etc to Tinsley or other locations in the Sheffield area. Greyhound (Alexander) used to have that contract I think, but not sure if that was before, or after, Boothies. Thanks for the info. Fascinating stuff! Does anyone have details of who had contract year by year? It obviously got shared around a bit over the years. Where were Allsop bodies built and what was the full title of the company, any one please? Thomas Allsop Ltd., Penistone Road North, Sheffield, Yorks., active from 1926 to 1949. It would be interesting to know what their production amounted to during their active years. They bodied two Daimler CVD6 coaches for Trumans of Shirebrook in 1947 (LRA 558/9) which were quite attractive and I seem to recall a former employee of Naylors of South Normanton telling me that Allsop’s carried out some refurbishment work for them on their pre-war coaches after WW2. Booth & Fisher used to run to Coal Aston via Brammall Lane. They went to Meadowhead, took a left then right down Dyche lane to Coal Aston. All very countrified in the 50s & early 60s. I remember this coach. 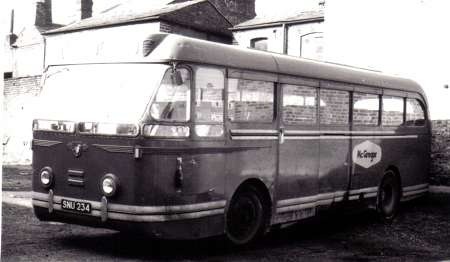 They sometimes ran a bus type bodywork, with the emergency door at the rear. I do not know where their stand was in town, but maybe it was just outside the main bus station, being a small operator. Whilst ever Halfway was in Derbyshire and Booth & Fisher were independent, they were condemned to outer darkness. Their stop was on Ellin Street, off Eyre Street, off the bottom of the Moor. Nowhere near Pond Street bus station. Just searching through views on the Stilltime Collection recently referred to on this site, I found a picture of sister Booth & Fisher Bedford, MNU 79 together with Royal Tiger SNU 435. I just entered Derby and Bus and it was on the last page of thumbnails. It’s Thomas Allsop Ltd (only one P)! I should know as it was my great grandads business! I don’t know a great deal about it, but my uncle knows a bit. I have a picture of an old vehicle (pick up truck with solid rear wheels) that was sign written at Matthew Street Sheffield. They then started at Penistone Road and was in partnership with a guy called Kitson? Great to hear from a direct descendant Neil. I have seen in some of the PSV Circle listings that historically, many vehicles went to Allsop, Sheffield for scrapping. Do you know if that is the same business, or a related business, as your Great-Grandad as an operator? Would really like to know more about the company if you learn any more from your uncle. I wonder if the Kitson was the one that was a founder-member of the firm that eventually became Sheffield United Tours? Booth and Fisher operated a selection of stage and works services from their depot at Halfway on the South Eastern outskirts of Sheffield. Whilst their staple stock for many years were Bedford OBs, they also bought AEC and Leyland single deckers new and amassed quite a collection of Albion Nimbus as well. Relatively unusual second hand purchases were two of these Bristol SC4LK from Eastern National in the late 60s. This one was Eastern National 446, the other ex 451 had the splendid registration 9575F. I suppose a common theme of Bedford OB/Albion Nimbus/Bristol SC was "lightweight" but then they did operate in the flatter areas across towards Worksop. 612 JPU is seen outside their depot in either 1967 or 1968 in company with other members of the fleet. Very nice indeed to see a smart but totally unpretentious livery and a very clean and tidy looking depot. I never came into contact with Booth and Fisher, but they appear to have been an operator with the right priorities – too many are just the opposite, employing "spin" with nothing behind it – especially nowadays. Strictly speaking, Booth and Fisher were a Derbyshire operator. Their depot is round the corner from the Halfway Supertram terminus and came inside the Sheffield boundary when the city expanded in 1967. The photograph must have been taken very shortly after this event. The trunk B & F route (Sheffield to Halfway via Coal Aston and Eckington) became SYPTE 253, briefly operated by "Aston" after deregulation. They were, in turn bought out by Stagecoach (then East Midland at Chesterfield) who run this route to this day as part of their new, expanded, Sheffield network. Stagecoach. of course, now operate out of the former Yorkshire Terrier depot in Holbrook – just up the road from the B & F depot. The B & F depot passed to SYPTE when they bought out Booth and Fisher and only recently TM Travel (now part of the same group as Trent Barton) moved into this depot – by now abandoned by First Group – from their nearby Stavely HQ. In latter years, B & F built up a large fleet of AEC service buses (and DPs) and Ford coaches. The last to be bought were a sizeable number of 6MU4R Reliances with Grant specification Panorama Elite III Express bodies – all of which passed to SYPTE. The featured SC4LK would have fitted in with the fleet at the time, though. It was sometimes known as the Bristol SB – fulfilling that role for Tilling Fleets – and even had propriety Bedford axles and other components. SCs were built in such small numbers that minimal expense was the order of the day for R&D. Like you Chris, I never came into contact with this well known operator, but vividly remember the name from the fleet news in Buses Illustrated as a teenager – Booth & Fisher, Halfway – as it always raised a smile. As you say, the livery is indeed smart and unpretentious, and all the better for it in the eyes of many. I’ve never quite understood the trend to dress modern buses up as circus wagons in order to attract motorists out of their vehicles. Most cars are single, or two-tone in colour, as manufacturers wish to convey a ‘perceived quality’ image. How many people would be attracted to a family car with a fancy colour scheme and vinyls covering the windows so only the driver could see out? Amazing how such established concerns such as East Yorkshire and Delaine’s (to name two) manage to retain a dignified traditional livery in a modern style. Ah! Quality! Well Chris Y, Booth and Fisher are long gone but their depot survives and is operational! Their fleet strength was around forty vehicles and when they sold out to South Yorkshire PTE, the garage was used by SYPTE for some time before being deemed surplus to requirements. Today, it houses the fleet of TM Travel, a Wellglade (Trent Barton) subsidiary who have operations in Sheffield and North Derbyshire with around 100 vehicles. In 1973 B&F bought some 12 year old Reliance service buses from Maidstone and District, and these passed to the PTE in 1976 when they were already 15 years old. You might think that SYPTE would have sent them off to Barnsley for scrap, but they kept them until 1980 when they were resold (as part of a job lot which included a Seddon Pennine IV-236 "midibus") to Silver Star of Upper Llandwrog (Gwynnedd). Repainted into Silver Star’s attractive two-tone blue and cream livery they gave good service for a few more years on the company’s stage services from Caernarfon to Rhosgadfan and Cesarea, suggesting that they had been excellently maintained by both M&D and B&F/SYPTE. Booth & Fisher were indeed a classic independent! I have a record of three ex Maidstone Reliances with Booth and Fisher (but there may have been more). all with Weymann DP40F bodies. I can’t be certain now about the accuracy of the acquisition dates, they may be the dates on which I first saw them. Check out this link for a comprehensive fleet list of Booth and Fisher. You missed 332 NKT, Ian, see fleet list. Bought 1975 with the last three 6MU4R, the last ever purchases before selling out to SYPTE. It had slipped past me that the last two were Duple bodied. I am looking for people who used to work for Booth & Fisher and knew my husband Ian Fretwell. I am going to give him a surprise party next year for his 65th. So I am trying to find as many of his old mates as I can, if anyone knew him please get in touch with me through this website. Or if anyone has a better idea on how to find ex Booth & Fisher employees please let me know. Between 1958 & 1965 I attended Westfield Comp. As I lived in Frecheville I had a school bus. Normally Frecheville, Birley and Base Green pupils were transported by Sharpes of Beighton. Over the years they had SBs augmented later by SC4LKs and LWL6Bs ex Lincs Road Car. 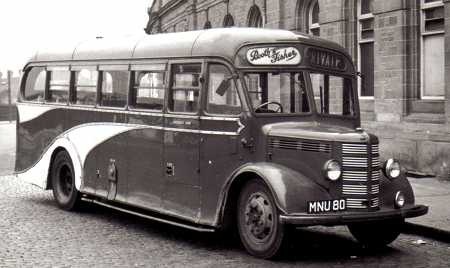 When the coaches were off doing coach work then one or more buses would be borrowed from Booth & Fisher. These were always from the large selection of OBs and OWBs. I doubt any-one had a more varied OB fleet than Boothies. Bodies included Allsop, Mulliner, Beadle, Barnaby, Roe, Woodhall-Nicholson and Duple. We never knew what would turn up, but could be sure of the bus having character!! Does anyone know how large the fleet was around 1970, they had an impressive garage which could hold most if not all of the fleet under cover. Jim, from 1970 the fleet tended to hover around 40. According to "South Yorkshire’s Transport" (Scott Hellewell, Venture, 1996) in 1973 44% revenue came from contracts (mainly NCB), 42% from stage carriage (Dronfield local [jt SCT/CCT]], Killamarsh-Dronfield-Sheffield, Beighton-Killamarsh-Worksop), 12% private hire/E&T, 2% garage business. The premises are still in use to today as the depot of Wellglade subsidiary TM Travel. Can anyone answer this question that has baffled me for years. As you drive past Clowne ponds you reach the crossroads of the Worksop to Chesterfield road, driving straight over for about 1/2 mile use to be a lane on the left that led to either 1 or 2 possible railway houses, in the yard was parked about 6 buses red I think, this was in the 70s and 80s,who was this firm, Kirkby Andrews were based in Harthill at that time but this wasn’t actually in the village, anyone know.